A photograph of a Soviet World War II memorial in Ukraine that commemorates the defeat of the Nazi occupying regime by Soviet forces. Eastern Europe and Russia are dotted with war memorials honoring the many Soviet soldiers and civilians who gave their lives during World War II. This memorial is located in Ukraine, which was invaded and seized by the Nazis in 1941. Soviet forces retook the area in the Dnieper–Carpathian Offensive in 1943, preventing the region from becoming the agricultural “breadbasket” of the Nazi empire. 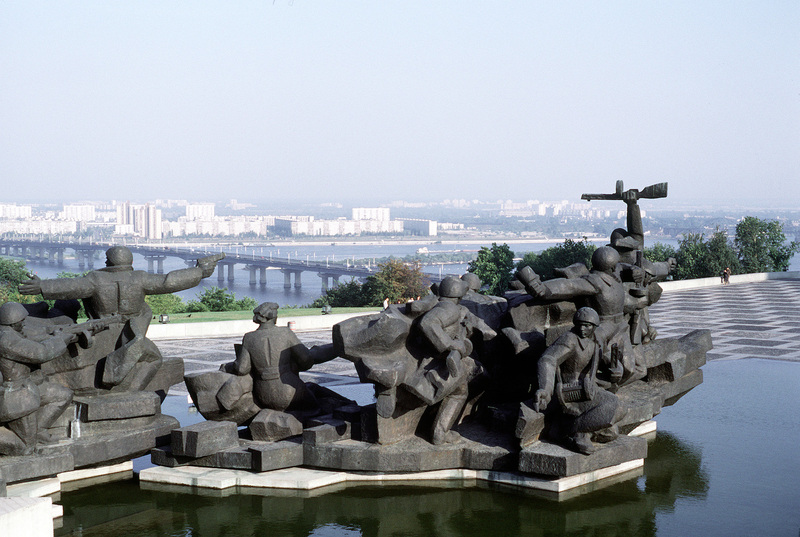 Department of Defense, “A view of the Soviet War Memorial on the grounds of the Memorial Complex of the Ukrainian State on the banks of the Dneiper River overlooking the city,” Digital Public Library of America, https://dp.la/item/e6edba6460afe80d1585669a62f6ff73. An American political cartoon titled “And if Russia is crushed” that expresses fear of Russian defeat by Nazi forces in World War II. A World War II political cartoon that communicates concern about the Nazi invasion of Russia by Dr. Seuss. A radio program highlighting World War II-era Soviet heroism based on a short story by a female Russian survivor of the Siege of Leningrad. A Soviet poster celebrating the female labor force that supported victory over the Nazis in World War II. A table of World War II casualties listed by nation. An excerpt from an interview with a Soviet soldier who survived the Battle of Stalingrad. An excerpt from a 1944 pamphlet on the Siege of Leningrad published by the Union of Soviet Socialist Republics’ American embassy. A 1942 political cartoon predicting Nazi defeat in the attack on Stalingrad. An excerpt from a talk by historian Timothy Snyder on the impact of World War II-era German and Soviet rule on Eastern Europe. A 1941 political cartoon by Dr. Seuss depicting Stalin serving a roasted Adolf Hitler. An excerpt from The Story of the Second World War by historian Henry Steele Commager about the German invasion of the Soviet Union. A 1952 US Army report on the impact of weather and climate on the Nazi invasion of the Soviet Union.